A lot of people are loving the upgrades the got when the changed to Windows 10. Their software gave them a great professional look on the desktop, better organization of the files and applications and an assistant that can help run programs, locate them, provide news and updates and more. Windows 10 was definitely a huge leap from its predecessor OS platforms, except for an isolated few who are experiencing activation errors on Windows. If you are having the same problem, worry no more, because this article will outline some quick fix for Activation error codes. You may perhaps taken advantage of the Beta version of Windows 10 prior to the problem you encountered. Do the following instructions to reactivate. Click Start to go to Settings. Click Update & security and then Activation. Click Go to Store.If you see a valid license available for your device then you should be able to activate without problems. However, if not, then you need to buy Windows from Store. If you cannot see a Go to Store option, contact your organization’s support team. You may have installed an application like a third party display language not currently supported by Windows, that is why you are getting this error. Run System Restore and reset your PC to an earlier setting. This should eliminate the annoying notification about your Windows binaries having been tampered. Also, make sure the time, timezone and date on your system is correct. In which case, you may get the following. Error code 0x80072F8F: A security error occurred. This activation error comes up if your computer’s date and time are set incorrectly or Windows is having trouble connecting to online activation service. Change the entries to the correct date and time. Click Start to go to Settings. Click Update & security and choose Network troubleshooter, then Internet Connection, then click run troubleshooter. Follow the instructions to identify and fix problems with your network. Reboot your PC to check if that fixes the problem. If the product key you are trying to enter into activation tool was a typo error or one that has already been used on a different system, you will receive this error and will be asked to either reenter or get a new product key. A product key that has been used on more than one PC than the Microsoft Software License Terms allow will disallow further activation. You should purchase a product key for each PC you use Windows with in order to fix this problem. Click on Start, then click Settings, then Update & security and finally, Activation. Choose Go to Store, and follow the Windows instructions for purchasing the software. 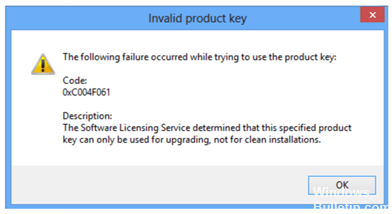 Error code 0xC004F061: The Software Licensing Service determined that this specified product key can only be used for upgrading, not for clean installations. You may receive this error if your previous version of Windows was not installed on your PC. You see, you need to have Windows 7 or 8 before entering a product key to upgrade to Windows 10. You will need your old Windows 7 or 8 installation disk to reinstall then retry the upgrade to the Windows 10. You can use the upgrade key you received to activate Windows or if your upgrade was a free upgrade, just skip the activation and continue the process because the server should automatically recognize your system as a receiver of the free Beta installation. Error code 0xC004FC03: A networking problem has occurred while activating your copy of Windows. Your computer failed to activate because you were not connected to the internet. Another reason could be that the firewall settings are preventing Windows from finishing the activation process. First, check for connectivity, then if you are sure that you are, open windows firewall and add the exception for the activation. If the problem persists, activate Windows via phone by going to Settings > Update & security > Activation. 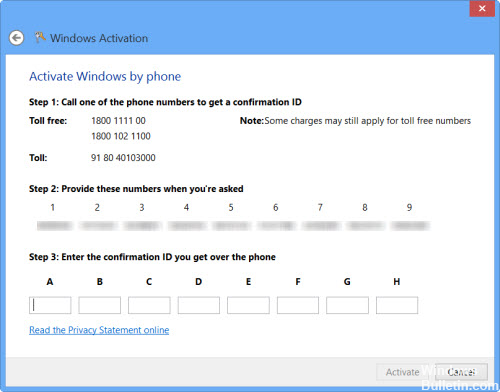 You will see a step by step procedure when you choose Activate Windows by phone. Just follow the activation procedure in order to activate your Windows 10. Error code 0x8007232B: DNS name does not exist. You may have been trying to activate your work PC at home. If you are not connected to your workplace’s network, Windows will simply provide you this error to tell you that you are trying to connect to the wrong network. You may want to bring your device back to office or make sure you are connected to the right network before you apply the product key. That should do the trick. Error code 0xC004C020: The activation server reported that the Multiple Activation Key has exceeded its limit. This activation error occurs when a Volume License (a license which is bought from Microsoft by a business to install Windows on multiple PCs) was used on more PCs than specified in Microsoft Software License Terms. To fix this problem, you might want to use a different product key to activate Windows on your PC. Your organization’s support person could help. Error code 0x8007007B: The filename, directory name, or volume label syntax is incorrect. Let’s say you are connected to work network but you are still getting this error. You need to contact your organization’s support team so they can help you change your network settings. Clicking Start and then Settings > Update & security > Activation. Select Change product key, and enter your product key. You will be prompted to enter an admin password, just do that and let activation process continue. There are very rare occasions when you will get an “Unspecified error” related to activation. If that is the case, click Start and then go to Settings >Update & security> Activation, and try to Activate Windows manually. If all else fails, then find your installation disk and reset your PC.